Global attention needed to prevent and treat AIDS in antiretroviral era, with 50% of hospital admissions in MSF hospitals already on treatment and showing clinical signs of failure. An unacceptably high number of people continue to develop and die of AIDS1-related diseases across sub-Saharan Africa. They remain left out of the global HIV response without access to treatment that prevents AIDS or the medical care they need, says Médecins Sans Frontières / Doctors Without Borders (MSF). In MSF’s briefing paper “Waiting isn’t Option: Preventing and Surviving Advanced HIV2” , which the data were presented at the International AIDS Society (IAS) Conference on HIV Science in Paris today, highlights that in MSF-run and MSF-supported hospitals in Democratic Republic of Congo (DRC), Guinea, Kenya and Malawi, people arrive in a state of such severe immune failure that overall mortality for patients presenting with AIDS is between 30-40%. Almost one third of those deaths occur within 48 hours. The main causes of illness and death are due to treatment failure or interruption and late diagnosis leading to delayed treatment. Unlike in the early 2000s, when little treatment was available, more than 50% of AIDS admissions at referral hospitals supported by MSF had already started antiretroviral therapy (ART), with many showing clinical signs of treatment failure. “Despite extensive access to antiretrovirals, there has not been the expected drop in late-stage presentations of HIV in developing countries. What’s different is that among people admitted to hospitals, the majority are already diagnosed and many have been on treatment for several years. In Kenya, in Homa-Bay, where antiretrovirals have been available for years, half of the patients hospitalised AIDS cases show signs of treatment failure. We’re pushing to switch these patients to second-line antiretrovirals more rapidly,” says David Maman, MSF Epicentre epidemiologist. At community level, MSF population surveys also show that a proportion of people living with AIDS in communities in southern and eastern Africa remain untested and untreated. Around 10% of people living with HIV in districts of Malawi, Kenya and South Africa had AIDS, of which 47% had never received testing or treatment. “People are still being diagnosed late. We need new ways to detect those left out, early on, before they arrive at hospital in often fatal condition or die at home without ever receiving care. Stigma and lack of information still remains high, leading to delayed treatment or no testing and treatment at all. This illustrates the need to complement increased antiretroviral coverage at community level with improved care for those on treatment for years,” says Gilles van Cutsem, MSF HIV Advisor. Clinicians, including from MSF, have increasingly voiced concern over the lack of attention and means going towards the prevention and treatment of AIDS across Africa. The World Health Organisation (WHO) recently issued its first ever guidelines for the treatment of AIDS in low-resource settings. While this is a positive step forward, MSF calls for the urgent implementation of the guidelines with additional measures to address potential drug resistance and treatment failure. Key interventions urgently needed to prevent and treat AIDS include the rapid rollout of ‘test and start’, CD4 baseline testing at ART initiation, routine viral load testing, point of care diagnostics for tuberculosis, improved treatment for cryptococcal meningitis, rapid switch to second-line ART for failing and advanced patients, and swift, effective and accessible treatment for opportunistic infections. MSF is also calling for models of care geared towards prevention, treatment and support for patients with AIDS, and free specialised hospital-based care free of charge for patients3. MSF is also concerned that the situation will only be exacerbated as funding for the global HIV response continues to stagnate. Anticipated cuts in US funding to the Global Fund (17%) and PEPFAR (11%) from 2018 onwards will see many countries facing further grant restrictions. Shrinking funding envelopes and the need to preserve ART purchases will imperil community responses, including targeted testing and improved treatment literacy and adherence, while starving essential investments needed for health workers, laboratory and diagnostics. “Each patient presenting with AIDS is a terrible testimony to the challenges to get timely access to test & treatment and to continue their ART uninterrupted. With global political will and funding for HIV on the decline, not only is the broader fight against the virus at risk go into reverse, but specifically these patients arriving at hospitals sick with AIDS will have any hope of reprieve snatched away,” says Mit Philips, MSF Health Policy Advisor. MSF currently supports over 230,000 PLHIV on ART in 19 countries, with a focus on free quality care, including test & treat approaches, improved adherence support and differentiated models of care. 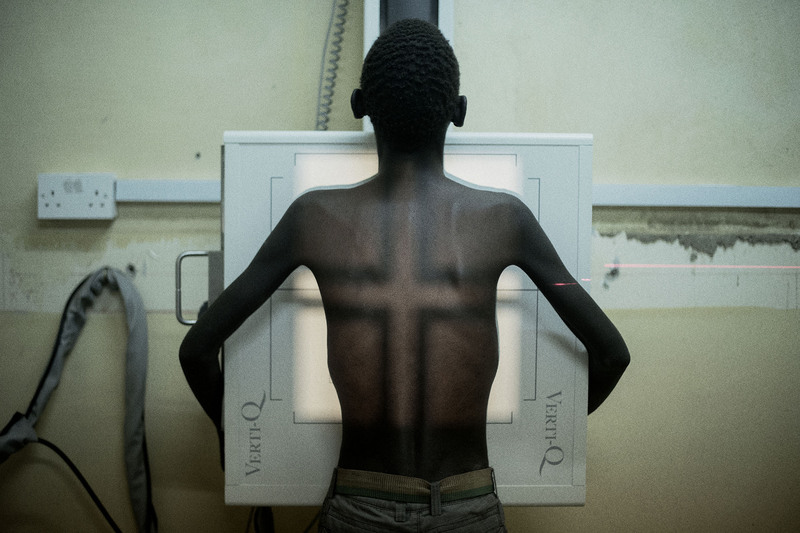 MSF directly provides or supports the provision of free hospital-based care for the treatment of AIDS in four hospitals in sub-Saharan Africa. In Homa Bay district hospital (200 beds) and referral health centres in Kenya, MSF supports and trains medical staff and provides medical equipment, laboratory support and drugs to improve the treatment of opportunistic infections (OI). In the Nsanje district hospital (200 beds), Malawi, MSF is training medical staff to improve diagnosis and clinical management of HIV/AIDS patients, while increasing laboratory services, pharmacy support and supplies of OI treatment. MSF runs a specialised AIDS care unit in Donka Hospital (31 beds) in Conakry and in Kabinda Hospital (42 beds), Kinshasa, DRC and supports Roi Baudoin Hospital, also in Kinshasa. These centres work with peripheral health centres to improve patient referrals and provide hands on training to improve the overall quality of care for HIV/AIDS patients. In all HIV projects, MSF teams are developing and implementing packages of diagnostics and treatment for HIV/AIDS, along with improved treatment literacy and adherence support. 1Acquired Immune Deficiency Syndrome (AIDS) is defined as a CD4 count of less than 200 or WHO clinical stage 3 or 4. 2Advanced HIV is synonymous with Acquired Immune Deficiency Syndrome (AIDS). 3MSF’s report "Les Négligés de L’infection au VIH" also released at IAS, shows the lack of referral-based hospital care for treating AIDS in Kinshasa, Democratic Republic of Congo (DRC).